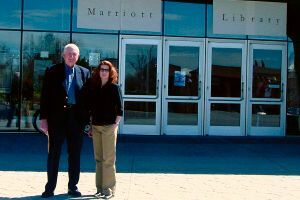 Burr and Shannon Novak in front of the Marriott Library, at the University of Utah. 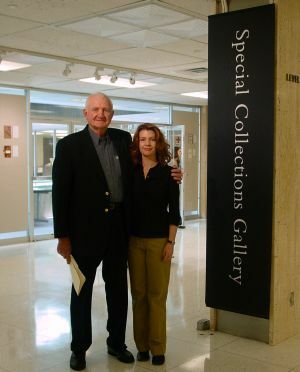 Burr Francher and Shannon Novak in front of the Special Collections Gallery. 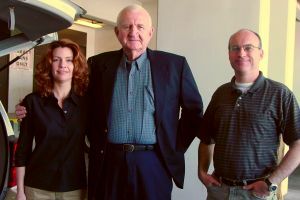 Picture above are Dr. Shannon Novak, Dr. Burr Fancher and Dr. Lars Rudseth. Shannon and Lars were on the staff at U of U at the time of the dedication and were very instrumental in opening an avenue for the libraries acceptance. 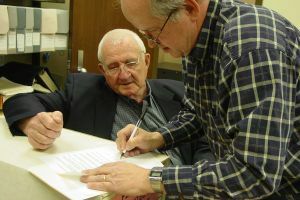 Burr Fancher and Stan Larsen signing the Memorandum of Understanding, regarding the Mountain Meadows Monument Foundation Special Collection . 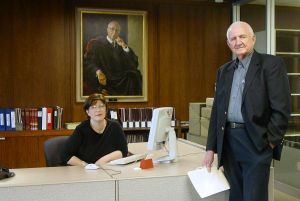 Burr Fancher, standing at the special collection desk. Scott Fancher is the sponser of this Mountain Meadows Monument Foundation Special Collection. 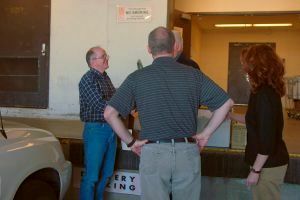 Curator Dr. Stan Larsen assist in the unloading of the Mountain Meadows Monument Foundation Special Collection . The Library is located on the campus of the University of Utah in Salt Lake City, Utah. The Mountain Meadows Monument Foundation is dedicating its 7th library in Prescott Arizona, on August 15th, 2008, with over 120 books relating to the Mountain Meadows Massacre. Each library costs $1600 to establish and maintain. 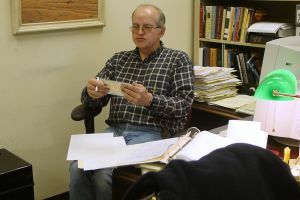 The funds for the library are donated by individuals interested in the true history of this tragic event that has been covered-up for 150 years by The Church of Jesus Christ of Latter-day Saints.